Scoping a CRM project is a critical step to ensure you are setting off on your CRM journey with a plan to equip you to success and benefits. Our guide, Scoping a CRM Project, will help to pull together these requirements by identifying key questions you need to answer for CRM success! 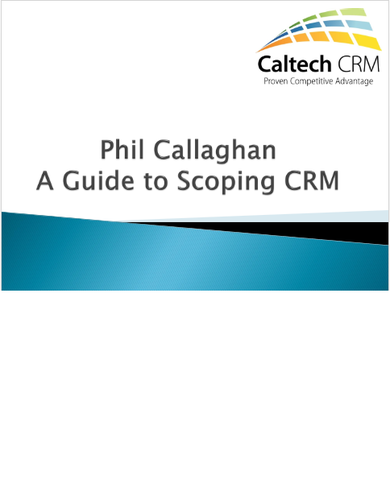 This guide helps to ensure that the planning is in place way before you start to think about CRM products or start to look for a CRM specialist. By structuring your processes and requirements in this way means that when you do start to look at solutions you know if it will be a good fit. Processes need to be in good shape as CRM will help to optimise them, offering automation and critical paths to open communication. For more help see our Top 10 Implementation mistakes you want to avoid, and use our Scoping a CRM Project guidelines to help avoid these common errors.